This chapter explores the key features of the concept of postnationalism, its modes, and theoretical implications regarding the European Union. The main research intention is to explore the EU as a model and an agent for reconciliation of the Balkan region. For that purpose, the main operative elements of both the South East European Cooperation Process and “Yugosphere” are examined. At the end, it is concluded that the emulation of EU postnational model by the Balkan countries enables the process of reconciliation. Hence, the Balkan states seems to be “forced” to cooperate with each other, in order to achieve their common objective – their full integration into the EU, which strongly confirms the role of the EU as an agent for reconciliation of the Balkans. 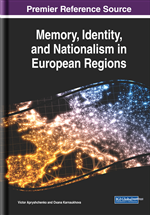 This chapter is an attempt to provide a qualitative research of the key conceptual characteristics of the postnationalism, its modes and theoretical implications in relation to the EU. The main research intention is to explore the EU postnational model as an agent for the reconciliation of the Balkan region. The term reconciliation1 in this chapter is used to describe the reestablishment of friendly relations amongst the Balkan nations. RQ1: How does the EU contribute to the reconciliation of the Balkans? RQ2: What are the means of memory restoration? As a research framework, this chapter takes the EU model of postnational networking, since the EU represents the most advanced postnational regional integration in the contemporary world. Also, this chapter focuses on the possible forms of postnational networking of the Balkans, taking into account the postnational impulses of the South East European Cooperation Process (SEECP) and the “Yugosphere” concept. Writing this chapter was inspired by the label of the Balkans and all those negative tags (the “balkanization” syndrome) that adhere to it, but also by the real negative experiences that the region is known for. In the academic literature, the “balkanization” is frequently related to “denote the process of nationalist fragmentation of former geographic and political units into new and problematically viable small states” (Todorova, 2009:32). Marija Todorova in the book “Imagining the Balkans” (2009) precisely explained this phenomenon: “to ‘balkanize' means to break up into small, mutually hostile political units” (Todorova, 2009:33). The opposite term of “balkanization” is “helvetization”. This term derives from Switzerland’s experience in overcoming the historical conflicts, crisis and wars, through the reconciliation, networking, and integration, and thus, building a solid and institutionalized cooperation, today embodied in the Swiss Confederation (Confoederatio Helvetica). All that, expanded by the presence, interest, and power of the EU in the Balkans, inspired this research. But why the EU? Many scholars treat the EU as a postmodern, post-statist and postnational model known worldwide. As for the EU, publications of Robert Cooper (2003), Anthony Giddens (1990; 1998), Strobe Talbot (2014), Chris Barker (2005), Steven Van Damme (2013), Rokas Grajauskas (2009; 2011), Laurynas Kasčiūnas (2009), Petros Kosmas (2011), Mark Leonard (2005), Pernille Rieker (2007), Jürgen Habermas (2001), and Mohammed A. Bamyeh (2001) can be valuable for better understanding of its postnational nature. Mohammed A. Bamyeh (2001) underlined the idea that the EU is treated as a model because it clearly represents the most advanced institutional indicators of a postnational regional networking in the contemporary world. The integration and governance literature generally defines the notion of postnationalism as а process or trend by which nation-states and national identities lose their importance relative to supranational or global entities (Postnationalism, 2013).